Bo and I celebrated 15 years of marriage early last month, and celebrated the 17th anniversary of our first date just a couple weeks ago. During that time, we have experienced our share of stress -- sometimes as a result of outside sources and sometimes as a result of internal conflicts. Through it all, we've managed to maintain our sense of humor and remembered our commitment to each other to weather both the good and the bad. 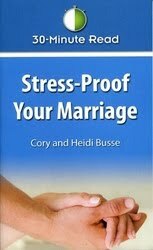 This quick read from The Catholic Company, Stress-Proof Your Marriage, is full of tips from a married couple. The book is only 61 pages long, so it doesn't take long to read through it. It was written by a married couple, who shares, with humor, tips about remembering what's important and avoiding negative stress in your marriage. A few years ago, Bo & I were part of the Engaged Ministry at 2 different parishes and enjoyed meeting with couples on their journey to marriage. This small book would have been a great complement to those meetings, as well as easy reminders to any married couple. We all go through periods of high stress, and it's nice to find some support and ideas to get through those times more easily. At $4.95, I think this book from The Catholic Company is a bargain.